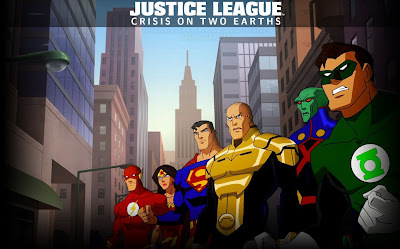 Having enjoyed the Superman: Doomsday, New Frontier, Wonder Woman, Green Lantern: First Flight and Superman/ Batman: Public Enemies animated movies from DC I'm totally hyped up to see even more footage (and behind the scenes extras) from the new 'Crisis on two Earths' release. The voice actors are all very well known and seem to fit their characters perfectly and the story doesn't seem too far off of the original source material so far so I'm sure I'll enjoy this as much as the others. So far I think I rate Green Lantern: First Flight as my favourite, I'm hoping this new film takes its place! You can view the first full trailer and get updates HERE on the official site. Enjoy the new video below.